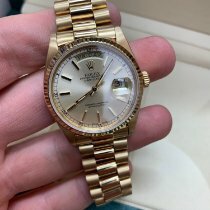 Rolex Day-Date President 118208 18k Yellow Gold Mens Watch. The Rolex Day-Date is the watch of presidents. Available in gold or platinum, it was the first watch to display the date and weekday fully written out. Several US presidents, including Lyndon B. Johnson, have relied on the "President watch." Introduced in 1956, the Rolex Day-Date was the first watch to display the date and day of the week written out in full on its dial. With this invention, Rolex once again became a pioneer in the field of watchmaking and in the luxury watch sector. The term luxury watch isn't a misnomer – this watch is only available in platinum or 18-karat gold. The so-called President bracelet is a semi-circular three-piece link metal bracelet developed especially for the Day-Date. Most of the other models, such as the Daytona, the Oyster Perpetual, and the Submariner, have the Oyster bracelet with flat three-piece links. This watch, also known as the "Rolex President", isn't just popular among statesmen: Major financial players, actors, and other celebrities also enjoy wearing these unique timepieces. Cuba's former president, Fidel Castro, and James Gandolfini, best known for portraying Tony Soprano on The Sopranos, are among those who have enjoyed wearing a Day-Date. Business magnate Warren Buffett is one of the wealthiest people on Earth and also wears one of these elegant watches. One piece, in particular, comes with quite a story: Marilyn Monroe apparently gave one as a gift to her lover John F. Kennedy. The message "Jack / With love as always / from / Marilyn / May 29th 1962" was engraved on the case back. Kennedy then gave the watch to one of his staff members to make it disappear. The watch resurfaced at an auction in 2005, where it was sold to an anonymous bidder for 120,000 USD. How much is a Rolex Day-Date? A classic 18-karat yellow gold Rolex Day-Date 36 in mint condition costs around 27,800 USD. You can find pre-owned pieces for about 18,500 USD. 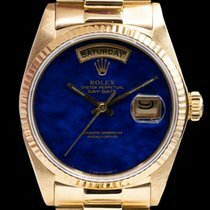 This 36-mm version has a President bracelet and a fluted bezel. However, the yellow gold Day-Date 36 is also available with an Oyster bracelet or a diamond-studded President bracelet. There are a few different options for the bezel as well: In addition to the fluted version, there are also domed or diamond-studded bezels available. The variety of dials is even more extensive. The ice blue or cherry red dials on the platinum versions are particularly appealing. Those who prefer an alligator leather band to a massive gold or platinum bracelet should take a closer look at the Day-Date models with Everose gold cases. If 36 mm isn't large enough for you, perhaps you would like the Day-Date 40. Its 40-mm Oyster case is the same size as many other Rolex models and still contemporary. Be sure to have around 29,300 USD on hand for a new example in 18-karat gold. The 41-mm Day-Date II is one millimeter larger and comes in at around 32,100 USD when pre-owned. You can purchase this watch in mint condition for nearly 37,100 USD. Models made from 950 platinum are the highlights of the Day-Date collection. This precious metal is even rarer and thus more expensive than gold. The variant with an ice blue dial in a quadrant motif and the reference number 228206 is especially striking. A mint-condition Rolex Day-Date 40 in platinum costs around 57,600 USD, while pre-owned versions sit around 48,900 USD. A platinum Day-Date II is a few thousand USD less expensive at 50,700 USD for a new piece and 44,500 USD for a pre-owned one. The 36-mm version goes for around 48,200 USD in mint condition, making it the most affordable platinum Day-Date. You can get a pre-owned edition for as little as 29,300 USD. The Geneva-based manufacturer exclusively uses yellow, white, and rose (referred to as Everose) gold or platinum for the cases and President bracelet. Even the index markers are made of 18-karat gold and won't tarnish over the years. The designers didn't just create the different colored dials in-house, but they also produced them almost entirely by hand. Dials come in blue, green, silver, ice blue, orange, black, and brown. Variants with mother-of-pearl dials are stunning, and many models feature diamond index markers . There are two types of bezels: fluted or, since 2000, a glossy, domed bezel that borders the sapphire glass on the platinum watches. The fluted bezel has been in production since 1956, as long as the Day-Date itself. The case is available in two diameters: 36 mm or 40 mm. The Day-Date II is available with a 41-mm case. Models with reference number 18038 are highly sought-after vintage watches. Pre-owned pieces go for as little as 12,000 USD. These Day-Dates from the 1970s and '80s have the so-called "Stella" dial. Stella dials are made of solid enamel and come in a variety of colors including white, yellow, blue, orange, pink, turquoise, brown, salmon, or even black. Enamel dials are usually "fired" in a furnace, but these colorful faces were created using a special kind of enamel varnish. The origin of the term "Stella" is not known, but there are at least two theories. The first holds that the dials were named after the American artist Frank Stella, as the colorful faces supposedly resemble Stella's colorful artwork. The other hypothesis is that the name comes from the Latin word for star, stella, and refers to the brightness of the dials. The first Day-Date with reference number 6511 was powered by the automatic caliber 1030. The day of the week disc, now available in more than 25 different languages, rotates over the date ring. Its small window is positioned in such a way that the correct day is displayed in full at 12 o'clock. Furthermore, the date window at the three o'clock position features the well-known Cyclops lens. The caliber 1055 powered the watch with reference number 6611 from 1957. Rolex optimized this movement's date mechanism: In the very first versions of the Day-Date, the accuracy would decrease when the date changed. This problem was solved in the new generation of calibers. More improvements came in the 1970s. Starting in 1972, some watches were available with the caliber 1556, which featured a stop-seconds mechanism. This allowed wearers to set the time to the exact second. Towards the end of the '70s, Rolex introduced the quickset date feature, which greatly benefited the Day-Date. The crown can be pulled out halfway, allowing the wearer to quickly set the date as well as the day of the week. Rolex has used their in-house caliber 3255 in the Day-Date since 2015. This movement has 14 patents. The designers reworked more than 90% of the caliber's components and further optimized them. For example, they made the barrel 50% smaller, allowing space for a spring with larger capacity. Thanks to the highly efficient Chronergy escapement developed by Rolex, the movement has an impressive power reserve of 70 hours. The caliber can power the watch through the weekend and still show the correct time Monday morning. The Chronergy escapement is an improvement on the Swiss anchor escapement made from a nickel-phosphorus alloy. Thanks to this alloy, the movement is not affected by magnetic fields. The manufacturer claims that the watch is 15% more efficient with this escapement system. The caliber's balance wheel operates at 28,800 alternations per hour. At the core of the movement is the classic Rolex blue Parachrom balance spring made from a niobium-zirconium alloy. Like the escapement, the balance spring is unaffected by magnetic fields. According to the manufacturer, it is up to 10 times more precise than other movements when subjected to jolts. The movement also has the classic upraised last coil in its spring, also known as a Breguet balance spring. This also improves the movement's accuracy. Precision index adjustment occurs via the Microstella nuts on the inner side of the balance wheel. Every Rolex caliber is certified by the Official Swiss Chronometer Testing Institute (COSC). The caliber 3255 also undergoes an internal testing process and is subjected to realistic conditions. The manufacturer claims that this process is twice as strict as that of the official COSC certification authority. No other watch is enjoyed by so many powerful people as the Rolex Day-Date. The "President Watch" embodies pure luxury, prestige, and power. Whoever wears a Day-Date emphasizes their influential position in economics, politics, or society. Every Rolex watch is a solid investment thanks to the company's consistent model and marketing policies. 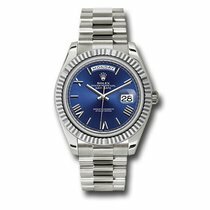 Timepieces from Rolex are therefore timeless, coveted collector's items which enthrall everyone, not just heads of state.